Cowley’s Nondestructive Testing program provides tremendous opportunities in safety & quality inspection. The NDT program offers an Associate of Applied Science degree that is currently in high demand. NDT students develop the knowledge and skills required to perform sophisticated testing techniques such as eddy current, x-ray, liquid dye penetrant, magnetic particle, and ultrasonic testing that are currently required in many different industry fields. NDT technicians are in high demand. The basis of inspection technology depends upon the technician’s ability to understand the principles of physics and use fundamental mathematical calculations to locate flaws in materials. Lives sometimes depend upon the ability of the technician to understand and have adequate training in this area. You will learn blueprint reading, basic metallurgy, measurement, and proper use of equipment used in the various NDT testing processes. Mid-level mathematics, communication skills, writing, and understanding codes & procedures, materials composure, and basic theories of economics are also integrated into the program. Upon completion of this program, students will be prepared to develop and maintain quality control programs. Students will be trained to set up and calibrate equipment, as well as interpret and evaluate results based upon Nondestructive testing methods with respect to applicable codes, standards, and specifications. Students will be prepared for the American Society of Nondestructive Testing (ASNT) certification examination. 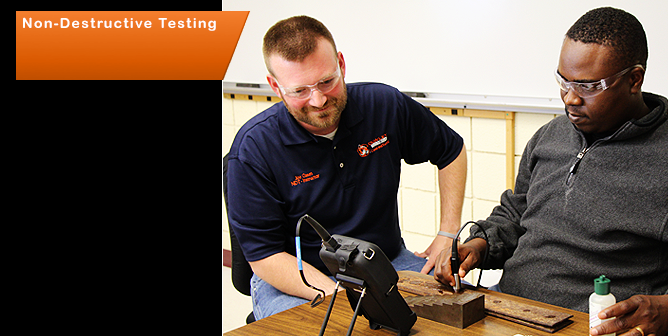 Classes in Nondestructive Testing began at Cowley College in 1991. Aerospace in Kansas and refining/oil production to the south in Oklahoma, created an industrial need for an NDT inspection program. Our location provides diverse industry support in the form of equipment, inspection materials, and program technical direction. Cowley College is an ideal setting for study. Arkansas City is located at the confluence of the Arkansas and Walnut rivers and provides students with a small-town experience. Class sizes have a maximum student-teacher ratio of 18:1, allowing for personalized instruction and an opportunity to build relationships. With the recent addition of a real-time x-ray system, digital film processing system and several 3D-phased array ultrasonic instruments Cowley now has some of the newest technology available in business and industry today. This equipment will allow the student exposure into the most current technology used in the NDT field. NDT Technicians must possess blueprint reading, mathematical skills, excellent communications skills, ability to interpret codes, and great attention to detail. What Can I Earn in this Field? Students graduating from the NDT program within the past five years (2002-2007) have earned an average hourly wage of $15-$24/hour depending upon the industry in which the student is employed. As with any industry, the more skills and knowledge the student has the more valuable they are to their company, creating higher pay for them. The Nondestructive Testing curriculum is offered as a two-year Associate of Applied Science degree involving 66 credit hours—48 required technical hours and 18 general education hours. The NDT curriculum is designed to provide entry-level employment skills and knowledge required by business and industry. Classes exceed requirements recommended by the Society for Nondestructive Testing document TC 1-A for classroom training. Our mission is to develop knowledge, skills, and attitudes necessary for students to succeed in a Nondestructive Testing Career. Our vision is to provide students with more than a technical skill. Rather, we will provide them the understanding of the need for life-long learning.